Many forklift accidents and injuries are caused by small issues. That’s why safety, training, and maintenance are so important for forklift operators; most safety violations aren’t that obvious to detect. The devil’s in the details – and that’s usually the case when it comes to “minor” safety problems turning into major accidents. Remember, every time a forklift accident happens, the U.S. Occupational Safety & Health Administration (OSHA) can investigate. If it’s determined that your company didn’t have the proper training in place, or skipped important maintenance checks, or a hundred other things, here’s the bottom line: you can be fined a significant sum. These fines can reach tens of thousands of dollars. Are you prepared to pay these fines and penalties? We didn’t think so – and you don’t have to! With training and certification from CertifyMe.net, your company will achieve OSHA compliance in no time at all, at budget-friendly prices! Cracked hoses – from hydraulic hoses to fuel lines, small cracks can lead to spills, improperly working lifts, injuries, and much worse! Tire pressure – your forklift’s tires should be inflated to the manufacturer’s recommended specifications at all times. From skids to tip-overs, tires are one of those “small” things on a forklift that can turn into a major headache. Safety mechanisms – are your backup alarms working properly? How about all of your lift’s safety lights? If not, get them checked and replaced immediately. Your forklift is designed to provide a measure of safety and protection for pedestrians, co-workers, and – most importantly – the driver! Those are three random “small” forklift safety issues than can turn into bigger problems. With a solid maintenance plan in place, you’ll have the best chance to avoid accidents and injuries. OSHA requires that every company have a maintenance plan to detect safety issues, address equipment that needs repaired, and other safety-related concerns. Conduct regular daily inspections. OSHA recommends a thorough visual and pre-operational check before every shift, and this is a great way to keep those minor safety issues from becoming catastrophic down the road. This check includes fluid levels, safety features, tire pressure, brakes, forks, and much more. Work with your company’s maintenance plan to develop a practical, sustainable maintenance checklist today. It’s one of the best ways to create a safer working environment. Pay attention to the forks. Every forklift requires a proper combination of balance, agility, and maneuverability to perform everyday tasks. The forks are a critical part of this equation. If the forks aren’t aligned or are damaged in any way, dangerous working conditions develop. Make sure your lift’s forks are attached correctly and are working as they should. If you’re not sure if your forks are operating as intended, check with your maintenance department immediately. Test drive for additional safety checks. Another easy way to keep small problems from turning into accidents or injuries is a quick yet through test drive. Ensure your lift’s acceleration, steering, and other driving mechanisms are OK. There are some things even the most detailed visual inspection won’t catch! Follow your maintenance schedule! We highly recommend that every forklift gets regularly scheduled maintenance. This includes regular daily inspections, backed by weekly / monthly checks, quarterly maintenance, and other safety checks. Here’s the bottom line when it comes to forklift maintenance: it never hurts to double-check your equipment! A solid maintenance plan is the best way to find out about small safety issues before they cause serious injuries or accidents on the job! Contact CertifyMe.net Today for the Best OSHA Compliant Training! 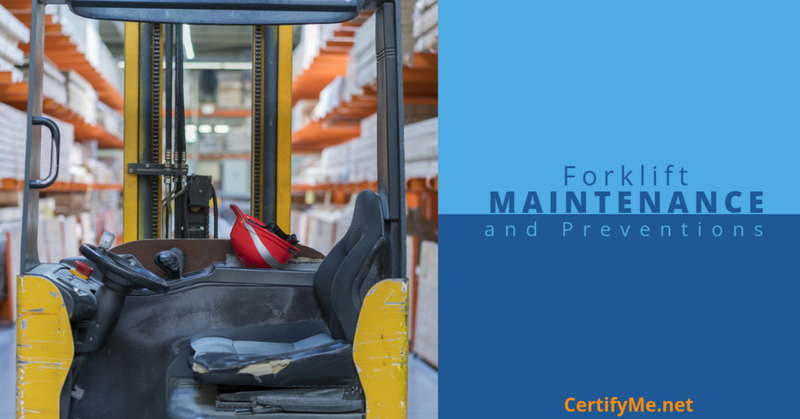 Here’s another small step toward big safety improvements: contact CertifyMe.net today for the most affordable and thorough forklift safety training you’ll find anywhere. With a great selection of courses for any skill level (beginner to advanced), our OSHA compliant training offers complete, comprehensive safety knowledge for your entire workforce. Eliminate your safety and training gaps. Give your workers the best training possible. Sign up with CertifyMe.net today – it’s one small step for your company, and one giant leap toward a safer, more productive workplace!